This book grew on me progressively. When I finished it I was between 2 or 3 stars, I rated it 3, to end up in 4. 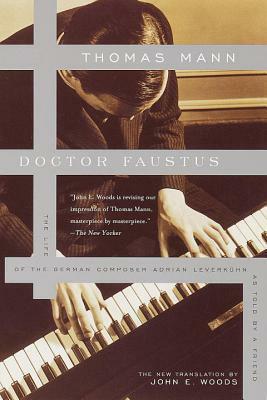 There were many reasons to like it: Beethoven’s life was there, the shy man entering the brothel (to touch only the piano from nervousness) was a young Nietzsche, Leverkuhn and his music was based on a real person -A. Schoenberg- his music too revolutionary to be appreciated at the time also. Actually Schoenberg had it worse, I don’t think any composer had ever been more depreciated and publicly humiliated in his early life than he had been. There were many historical and cultural references and great descriptions of the collective consciousness of the german people in the interwar period -humiliated after the first war and beginning to revive memories of past glory (relevant today as Germany is at a peak). There were also mentions of people who could see the horrible consequences to come but were too few or too late to speak out against the populist tide (relevant always). And then there were the long, apparently irrelevant passages, describing so many characters or uninteresting events and with a style not easy to follow. I even got the impression that the descriptions of music were more complex than they could have been. It took too long for the climax, too long for the devil to appear, too long for the protagonist’s great last act. I feel the wind of another planet. Used to look my way in friendship. I happily surrender to the great breath. I am only a whisper of the holy voice. This book could have been much shorter, actually I was wondering if a novel like that could ever be written and published nowadays when most people (and editors!) value easiness and brevity more than content. That being said, I was left with a bittersweet taste. However after finishing its 800 pages of the greek translation (and being very content to have finally done so), it kept bugging me. A week passed and I felt the need to read again the chapter with the devil. A week later and I read it once more. Few days after and I would look through the book for passages about Germany. And then I caught myself longing even for the “irrelevant” chapters, wanting to read them just for the style they were written. In the end, difficult and lengthy though it was, I believe this book deserves a second read to get the most of.